When patients come to Family Implant & Reconstructive Dentistry with missing teeth, they’re usually worried about the appearance of their smile. 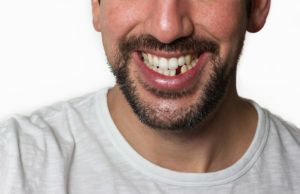 Gaps in the mouth can be unsightly and embarrassing, and when patients are shopping for tooth replacement options, their primary concerns involve their appearance. But did you know that tooth loss can affect more than just your smile? Your body is an intricately connected machine, and when one part isn’t functioning properly, the others can begin to falter as well. Dr. Richard Grubb is here to explain to Havre de Grace residents some of the dangers that arise from having missing teeth and offer solutions for maintaining good oral health. If you’re living with missing teeth, you’re certainly not alone. The American Academy of Implant Dentistry cites that 69% of Americans between the ages of 35 and 44 have at least one missing tooth. A quarter of Americans over the age of 74 are missing ALL of their natural teeth. Tooth loss is a fairly common issue facing adults in the United States. There are a number of reasons why people have missing teeth, but most frequent causes involve dental injury, neglected oral health and age. Dental injury: The periodontal ligament that holds teeth in their sockets can become stretched when extreme force is placed on the teeth. This stretching can lead to loosened, damaged or knocked out teeth. Forces that cause dental injury include falling, sporting accidents or teeth grinding. Poor oral hygiene: Lazy brushing and flossing habits as well as neglected dentist visits increase the risk of gum disease and tooth decay. If these conditions are left untreated, your teeth can get sick or injured and eventually fall out. Age: As we age, our tissue and bone naturally begin to weaken. Conditions like osteoporosis are common in older adults and can affect the gum tissue and ligaments that support the teeth. When bone density weakens to a certain point, teeth can fall out. The human body is designed to function with all 32 teeth for optimum health. Gaps in the gums can lead to a host of adverse side effects that extend beyond the mouth. Effects on jawbone and gums: Missing teeth disrupt the interaction between teeth and bone. When a tooth falls out, the gum and bone left behind are no longer required to support a tooth, so they remain unstimulated. The jawbone then begins to shrink and the gums recede. Ultimately, this weakens the structural components of the neighboring teeth until they collapse. Effects on appearance: The jawbone, gums and teeth serve as support structures for the face. When the mouth has gaps and missing teeth, the structure diminishes. This can make the cheeks appear hollow and saggy, causing premature wrinkles. Effects on digestion: Having several missing teeth can affect the way that you chew. When food isn’t chewed thoroughly, the body is deprived of key nutrients. Also, patients with missing teeth tend to avoid healthy foods that are difficult to chew, like some fruits and vegetables. Effects on mental health: It may not come as a surprise that your mental and physical health are intertwined. A survey conducted by the Academy of General Dentistry found that 86% of patients associate social embarrassment with having missing teeth. Feeling embarrassed by the gaps in your mouth is not uncommon, but can be difficult to overcome. Dental implant surgery is the only restorative dental treatment that can help prevent and reverse the effects of tooth loss. Replacing teeth with dental implants can completely counter the problems described above. Dental implants are permanent replacement teeth that are made to look and act like natural teeth. The prosthetic tooth is situated on top of a titanium post. Titanium is a biocompatible material, which means that it can integrate with the human body without causing any adverse side effects. 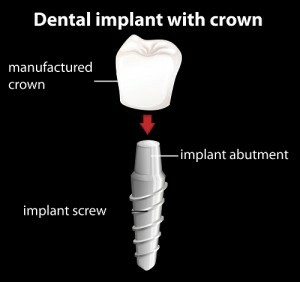 After the dental implant is inserted, the jawbone and the titanium post osseointegrate or fuse together. Once the surgical site is healed, your dental implant is ready to be used just like a natural tooth. Unlike traditional bridges or dentures, dental implants replace all parts of missing teeth. The titanium post acts like the root of the tooth, providing the jawbone with the support and structure that it needs to stay strong. Whereas bridges and dentures allow the gums and jaw to deteriorate, dental implants supply muscle and tissue stimulation, keeping the gums and jawbone active. Dental implants are designed to look natural. Dr. Grubb will make sure that your prosthetic tooth matches the color and shape of the neighboring teeth. Once the surgical site is healed, you can smile with confidence knowing that your new dental implant is natural-looking, strong and healthy. The health of your teeth and mouth impact the overall health of your body. Gaps in your smile can wreak havoc on your other organ systems and be detrimental to your body as a whole. If you are living with missing teeth, don’t hesitate to make an appointment with Dr. Grubb at Family Implant & Reconstructive Dentistry to get your health back on track.